Ethernet LANs are used where small groups of high-availability nodes at the network edge need to be connected into larger LAN structures. The Magnum ESD42-Series, a versatile family of small Edge Switches, uses new dual-homing unmanaged switch networking technology (patent pending) and innovative product packaging to serve redundant edge-of-the-network applications. 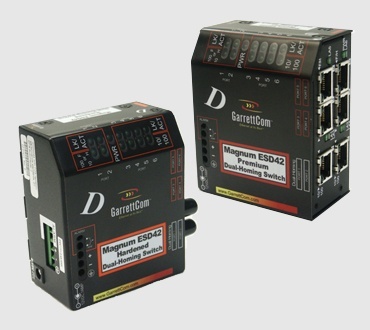 The compact ESD42 Dual-Homing Edge Switch design delivers 6 Ethernet ports, two of which (ports 1 and 2 for dual-homing) may be either fiber or copper and are reserved for use in connecting the ESD42 into the upstream network. The other 4 ports are regular auto-negotiating auto-cross RJ-45 ports.These ports may be PoE ports for attachment of PoE devices.In either case, the nodes attached gain a high-availability network connection. 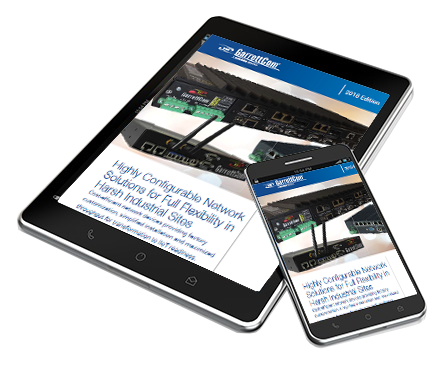 Fiber port choices cover all multi-mode and single-mode fiber connector types. Dual Homing - Dual-homing on Ports 1 and 2 provide a redundant upstream connection.In Ethernet LANs, dual-homing is a network topology that adds reliability by allowing a device to be connected to the network by way of two independent connection points (points of attachment). One connection point is the operating connection, and the other is a standby or back-up connection that is activated in the event of a failure of the operating connection. Port Flexibility - Offers 6switch ports, 1 or 2 of which may be 100 Mb fiber, others are 10/100 copper.